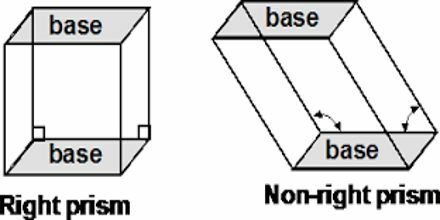 A right prism is a solid which has two parallel planes of same shape and size. Also, its lateral surface are perpendicular to its parallel sides. Measure Volume = Area of cross-section x Distance between parallel sides = Base area x height. The volume of a triangular prism can be found by multiplying the base times the height. Both of the pictures of the Triangular prisms below illustrate the same formula. The formula, in general, is the area of the base (the red triangle in the picture on the left) times the height,h.